The total output of digital publishing in Shanghai amounted to 18.5 billion Yuan (US$2.73 billion) in 2009, according to a statement released by Shanghai municipal government on 1st August. Ms. Jiao Yang, the head of Shanghai Bureau of Press and Publication, said the city has been building the nation’s first base for digital publishing with various investments both from the central and local government. In the past year, the complete output of press and publications in Shanghai reached to 84.5 billion Yuan (US$12.47 billion). Shanghai is responsible for 25% of the whole country’s digital publishing output. Also, China’s General Administration of Press and Publication released it first industry analysis report since 1949, when the Communist Party of China took the power on 27th July. And it claimed the total output of the national digital publishing amounted to 79.44 billion Yuan (US$11.73 billion), and the mount of mobile publishing reached to 31.4 billion Yuan (US$4.63 billion). According to the classification of the report, digital publishing in the country consists of mobile publishing, Internet games, Internet journals, e-books, and online publishing of newspapers and web advertisements. 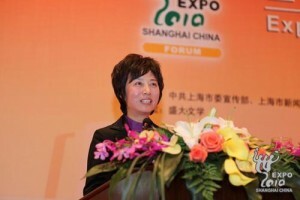 Wuping Zhao is the vice president for Shanghai Translation Publishing House. He joined Shanghai Century Publishing Group in 2001 and acquired many literary authors including T.S. Eliot, Jorge Luis Borges, Vladimir Nabokov, Boris Pasternak, Jack Kerouac, Simone de Beauvoir, Marguerite Duras, Milan Kundera, Umberto Eco, Mario Vargas Llosa, Elfriede Jelinek and Bernhard Schlink. He graduated from Columbia Publishing Course in 2009. Prior to his publishing career, he spent seven years as a book reporter at China Reading Weekly in Beijing.